In a twist of singling out architects in the Vegetated Architecture realm, a profile of a landscape architecture firm that is pioneering the use of vertical greening techniques. The Vancouver firm Sharp & Diamond have been developing a number of North American examples, which is in dire need of good examples. I've been familiar with Randy Sharp from S+D since I heard him speak in Denver at GreenBuild 2006, in a session entitled 'Pushing the Envelope' where he discussed living walls. I am also signed up to take a Living Walls 101 class offered by Green Roofs for Healthy Cities so I thought it a good opportunity to find out more about the work that Mr. Sharp and his firm are doing. From the S+D website bio, Sharp: "...has a passion for transforming urban environments and making sustainable methods visible. He has a deep knowledge of high performance building and landscape systems including permeable paving, ecosystem restoration, living walls and green roofs." Sounds like a Veg.itect to me. This fits into a project profile for green roofs + living walls, from the website as well: "Vegetated building envelope systems moderate the microclimate of the neighbourhood and improve the comfort of building occupants. Green roofs provide shade, evaporative transpiration, rainwater harvesting, thermal mass and natural ventilation. Eco-effective technologies include extensive green roofs, rooftop gardens, green facades, living walls and urban trees." 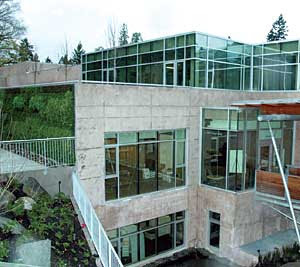 A particularly interesting project was the Vancouver Aquarium, which was also featured in Architectural Record, specifically focussing on the 500-square-foot vegetated wall for the new building. A profile of the project and some more thumbnails is available at Greenroofs.com. Additionally, Greenline featured a story about the aquarium as well with some kinda fuzzy photos - the article is worth a perusal though. A quote from the article with some technical specs: "The green wall is approximately 3 meters by 15 meters and is estimated to include about 7,000 plants. Each plant is tucked into an individual container which are aggregated into a larger modular polypropylene unit. The units are then attached to the concrete substructure using a system of wall mounted steel braces. 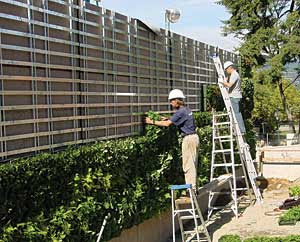 It is important to note that most green walls are designed as lattice or trellis where the plants are allowed to grow up the facade. This installation is very different because the planting medium is actually hung off of the wall and includes irrigation." For a project dubbed North America's First permanent Living Wall - someone needs to work on the PR for this project (and the quality and availability of photos)... The firm has worked on some other rooftop greening projects in Canada as well, including the Sechelt RCMP Justice Building, and the Burnside Gorge Green Roof in Victoria. Overall, it's interesting to see the firm's overall bio, which makes a point of incorporating vegetated architecture into it's structure. Again from the website, Sharp & Diamond: "...provides a diversity of consultative services ranging from landscape architecture, site planning, urban design and construction administration to LEED® documentation and ecological design design for stormwater, green roofs and living walls." I am definitely looking forward to the seminar... and perhaps stumbling upon a few more images.